The CL4NX and GL412E label printer will work with either code based labels, or the System Five Label designer, making it a good solution that will allow end users to easily create simple, to complex labels without having to learn printer code. This printer can print in direct thermal mode for printing on thermal label stock, or in thermal transfer mode (With the optional thermal transfer ribbon). The CL4NX also has the ability to print to many of the label stocks that garden centers use on a daily basis such as the loop labels used for labeling trees and shrubs, to the pot stick labels used to label smaller plants. The only limitation is that the width of the label or combined labels can not exceed 5 inches, because that is the maximum width of the print head assembly and output guides. However Please note that the printer can accept stock that is 5 inches wide, but the print head is only 4.1 inches wide. So you will need to be aware when you purchase label stock for the printer, that you will only be able to print on the first 4 inches of the label starting on the left most edge. This would be fine for stick tags where the right most 1 inch of the stick is inserter into the ground, so you would not want to print on that area anyway. Also it is important that the label stock is fed correctly. It must feed under the feed guide, or you will get out of paper errors. This is the correct path for the stock. It will be the same for all label stock regardless of whether the stock feeds off the top or off the bottom of the roll. For peel off label stock it is also important to note that the label must be positioned with the label facing up, and the backing paper facing down. There are a few minor issues that will need to be discussed here as well. One being that the Windward Label designer does not have the ability to rotate items on the label. So the 5 across tree tags can be a bit more difficult to set up. First you need to set the stock size in the Windows Driver for the Sato CL4NX, and then set it to Landscape, so that the label is rotated 90 degrees. Now you can setup a new label in the System Five Label Designer to build the label. And the label should be laid out something like this. Many different stocks will work with these printers, provided that they do not exceed 5 inches across. 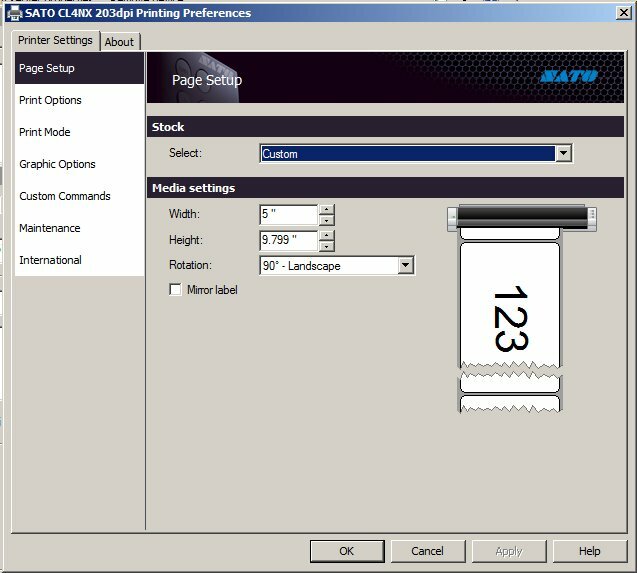 This is due to the limitation of the width of the print head, and feed guides. The feed mechanisms are closed on both sides, so there isn't any way that a stock that exceeds 5 inches will pass through the printer. The length of the label is less of a concern because the labels are a continuous roll. These Loop Tags WILL NOT work because they are almost 7 inches wide and will not fit through the feed guides. These Loop Tags WILL work because the combined width of the tags (1 inch wide by 5 tags across) are 5 inches wide. The maximum width allowable. Please note that in this printer only 4 of the 6 tags will print because the print head is only 4 inches wide. So the right most tag will print blank. This is ok for testing purposes here. But you will want to ensure that you are only using 1 inch, 4 across loop labels. Otherwise you will always be wasting one label for every 4 you print. These stick tags will also work because they are 5 inches wide. You will want to make sure that the pointed end of the stick is fed through the printer so that they are oriented pointing to the right. Standard peel and stick labels will work just like any other label in System Five. Again, the printable area of the print head is only 4.1 inches, so each label, or combination of labels can not exceed 4 inches, or the right most edge will be blank. Normally I would not recommend using labels that are narrower than a 2 inch label if you are planning to use them as barcode labels. While it may be possible to print the barcode small enough to fit on a smaller label, I have seen times where the barcode scanner is not able to read the smaller barcode. I did print a small barcode on a 2.25 x 2 inch label in one of my examples, and was able to scan it with a POS-X 2D barcode scanner here. However Some scanners have a lower resolution scanner in them that may require a larger barcode. Also the 13 digit barcode will be larger than an 8 digit barcode.